It’s been said that the choice for connectivity comes down to coverage and cost. But that assumption – that to keep costs down you have to sacrifice coverage and vice versa – doesn’t have to prove true. 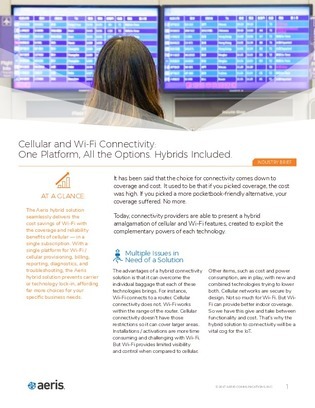 This brief explores how to take a hybrid approach that combines the power of cellular and Wi-Fi to support your connectivity needs. Learn about Aeris’s hybrid approach to wireless connectivity.